Welcome to the Yoga Church Sunday Sermons. I have to admit that my intentions haven’t changed much over the past year. I’ve been focusing on the idea that “I am a maker.” And making my dream of the Yoga Church Sunday Sermons a reality has required some pretty serious effort. So with this season change I’m celebrating the fruits of my labor! And settling in to nurture the early seeds of this community. Thank you so much for joining me on the journey. This week I painted a season wheel and created a printable pdf for you. Just click the image below to download your copy! I am an embodied creature living in a material reality. I am effected by the weather and injury. I am surrounded by trees and birds, buildings and people. I deal with the stress of money and difficult relationships. I experience joy and grief. Every morning I wake up and start my day. And over the course of the hours spread out before me I make hundreds of decisions. I experience the reality of Being. Of existence. I go to sleep. I dream. And then I wake up to another day. You’ve heard me say so many times that life is the journey between birth and death. But it’s also the journey between sleeping and waking—of night and day. The journey between work and rest—of weeks and months. The journey between planting and harvest—of seasons and years. If we’re going to explore the question of “How do I live knowing that I will die?” we have to explore the cycles we move through in this life. The sabbath is a way of consecrating time—and in case you’re unfamiliar with the word, consecrating simply means “we’ve decided to make this thing sacred.” I can’t speak for individuals, but when I look at the culture I live in—I don’t feel a sense of sacredness in relationship to time. Time is marked. People are excited for the weekends because for many it means not going to work. And there’s summer vacations. And, of course, the season of the holidays, which we may get excited about, but often in this country it just ends up being about stress and consumerism. Time is a fascinating subject. Wherever you are right now, take a moment to notice what time it is. How did you figure it out? Did you look at your phone or your watch? Many of us understand time as a thing that just exists and always has. But the concept of Universal Time accepted by the world has only been in existence for 134 years. The time your watch tells you it is, was decided at a conference in 1884. 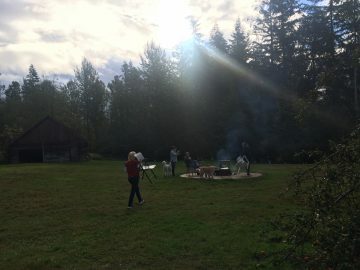 For most of human history, people paid attention to the sun. The cycle of night and day and seasons set the rhythms of life. But we, with our electricity, food transportation systems, and internet are no longer dependent on the sun. Of course, the last 6 words I just said are ridiculous! We are deeply dependent on the sun. What I should have said is that we, with our electricity, food transportation systems, and internet have forgotten our dependence on the sun. Let me be clear, I’m grateful for all this technology. I’m able to sit in a warm building and write on a computer and send what I write out to you through the internet. I’m far from a luddite. But I would like to invite you—and me— back into relationship with the sun. And the moon. And the seasons. Back into relationship with dirt, sky, roots. Back into relationship with the space, air, fire, water, and earth that make up our bodies and our world. I’m not saying I want to go backwards in time. I just don’t think that our 21st century lives have to mean that we’re disconnected from the seasons. Now, I know, many of you are saying to me right now: “I’m not disconnected from the seasons… When we lose daylight I experience lethargy and sadness.” And I know others who love the winter! So, we notice the seasons and our daily lives are impacted by them. But I would like to go one step further. I’m asking you to join me in consecrating the seasons—to choose to make them sacred. Every year the seasons remind us of the journey we’re making from birth to death… And, like the hero’s of our scriptures, the seasons give us hope that we can return from death back to life. The spring equinox lines up with the celebration of Easter, which tells the story of Jesus rising from the dead. And every year, with the arrival of tiny green shoots, we are told that spring follows winter. We are told that life prevails. But many of us in the modern world weren’t raised in a religion. And many who were didn’t choose to stay. Because of this many of us don’t have a sacred rhythm to follow. So what I’m proposing here, is a spiritual practice of season keeping. I certainly didn’t make it up. It’s been going on for thousands of years—practiced in one way or another by our ancestors (no matter who they were). In the northern hemisphere we just had the Autumnal Equinox and entered the season of fall. The equinox marks the moment when the sun’s path crosses the equator, and day and night, for one cycle, are equal. The equinox offers us a moment to experience and reflect on the balance of light and dark in our lives. As we move past the Autumnal Equinox, day becomes shorter than night. We are moving into the darkness. This is a time of year that we experience both the harvest—the fruit of our efforts all year, and the reality of compost as leaves turn and fall. As we move toward darkness we are faced with the reality that death is the cost of life and we are given time to face our shadow. This season can be depressing. But if we approach it with intention it can offer a time of deep introspection—a time of inward wrestling with big questions like who am I? Or more specifically, who am I becoming through the seasons of my life? What direction am I moving in and how am I getting there? As we move toward outward darkness, I wish you the blessing of time with the Light Within. The last few weeks I’ve quoted Diana Butler Bass who wrote: “This world, not heaven, is the sacred stage of our times.” Does this quote resonate for you? How do you experience the world as a sacred stage? Did you grow up with any sort of rhythm that helped you mark time? Was there any time that your family set apart as sacred? If so, have you kept the traditions of your family or have they changed in your adult life? Do you have a way of marking time in your life now? What’s the balance of light and dark in your life? Metaphorically speaking, what color are the lenses you look through? Always rosy? Always smokey? Are you able to be present with hard realities? Can you see the good in your life? If you live in the northern hemisphere, how do you feel about moving into darker days? Welcome to the season of fall. I invite you to take a moment to pause and notice who you’re becoming through the seasons of your life… Take a look back over the past year. What seeds did you plant? How did you help them grow? What are you harvesting now? What’s ready to be released (into the metaphoric compost bin)? What intention would you like to set for yourself this season? I encourage you to articulate it, write it down, and place it somewhere you’ll regularly see over the next few months. We all benefit from the wisdom of spiritual community. And community means more than one voice, so please add yours to the conversation. Thank you for these blessed words! 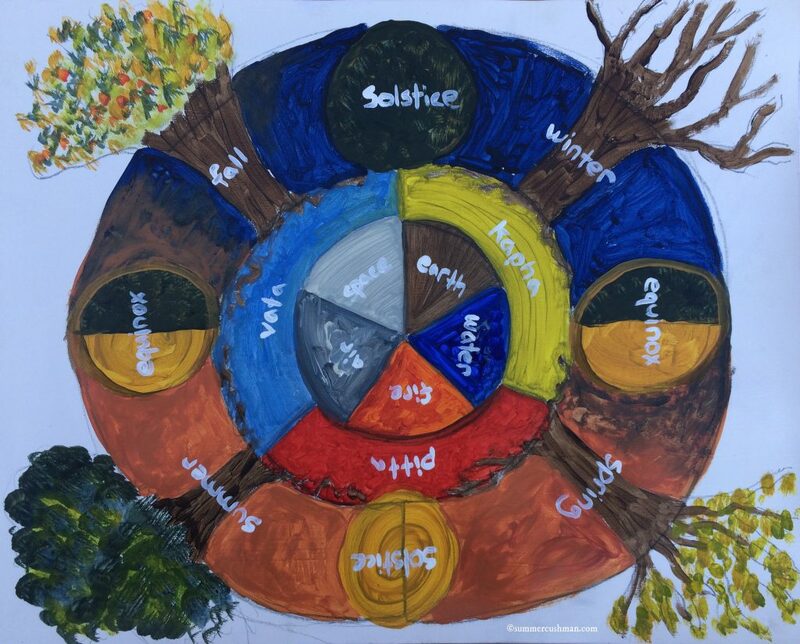 Beautiful painting of the season and the cycles. I love the practice of holding the seasons and their changes as sacred. This season has always been my favorite. This year it has special poignancy as I’ve ended a relationship and just moved to a new home. So ironically, as I’m nearing the autumn of my life, I’m facing another new beginning. Another new cycle in deciding what my life is going to be and how to live it with full intention. I’m trying to devote time to thinking about the seeds I want to plant this year. I think life is a “sacred stage” because of the choices we make as we act upon it create who we are in relationship with ourselves, other people and the universe. Thank you for this sermon and your ministry! I am grateful to be drawn into this practice of “season keeping” in the form of intention setting. My life is often marked by the crazy ebs and flows of the liturgical calendar – ruled by advent, christmas, lent, eastertide, ordinary time… and even so I feel the detachment you’re talking about. I am attuned to the liturgy of my tradition, but detached from the shifting seasons. If not for this sermon two-parter, I would have missed the fall equinox all together! haha. I am sensing the desire in myself to reconnect with season keeping, and in so doing my own growth and becoming… I’ll start with the intention setting you suggest.